There’s something transformative about a bowl of congee. 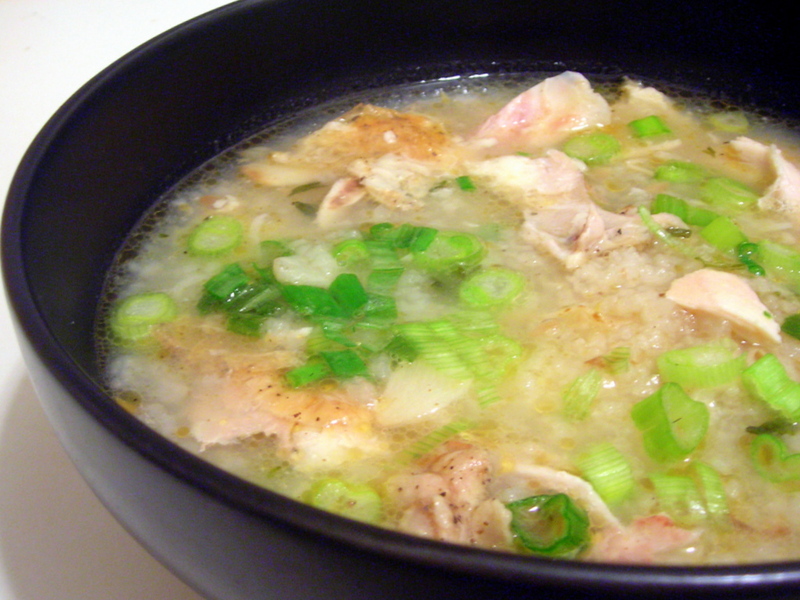 To most people, it’s just rice porridge. Set a bowl in front of me, and it’s as if I’ve stepped back in time. 1974 in the Philippines. I’m in my grandmother’s house in Manila. There’s a teak dining table on the third floor. We’re gathered around it for our weekly Sunday lunch. It’s as if I’m a kid again, the worries of my middle-aged New York life forgotten for a few minutes. This recipe is adapted from the version that’s found on Lucy’s Kitchen Notebook. 3 tablespoons of jasmine rice soaked in 1/2 cup leftover garlic broth from Sunday night’s dinner (see the post on sopa de ajo), then combined with 4 cups water and gently simmered, partially covered for two hours. Stir every so often to ensure that the grains don’t get stuck to the bottom of the pot. If you find that the liquid has reduced, add more water. Lucy mentions that the congee will eventually take on a gelatinous quality. My experience differed somewhat, although that may have been because I used jasmine rice and not long-grain white rice (my default whenever I make jook). The texture will be quite soupy however. Eventually the grains will begin to break down and thicken the gruel. Towards the end — added a bit of sesame oil, a pinch of salt, the same amount of white pepper, some leftover cooked shredded chicken and chopped scallions. If you don’t have those on hand, you can substitute other toppings. They can range from crushed peanuts, fermented bean curd, salted black beans, strips of fried dough, bits of thousand year-old egg to fried shrimp paste redolent with garlic, Sichuan chile paste, sriracha, chopped cilantro or celery leaves. The sky’s the limit. For my own tastes, less is more. All I require are a bit of salt, a tangle of shredded ginger and a pinch of white pepper. It’s memory in a bowl. 10 Jun	This entry was published on June 10, 2010 at 12:01 am. It’s filed under Chinese food, food, general, writing and tagged chicken, congee, cooking, dinner, leftovers, writing. Bookmark the permalink. Follow any comments here with the RSS feed for this post.